This here is Enki’s gun that he wanted me to review for him. Fine piece of work right here. SUMMARY: This detailed gun matches the C11 with 480 feet per second firepower. Although they both share the same firing mechanisms, they do share some flaws, mainly with the clip. Sometimes when I was feeding a clip in, the magazine spewed BB’s everywhere. It’s pretty accurate, competing with the C11, and the 357W. I found the gun very enjoyable, however the top was heavy in comparison to the handle so the front drooped down a lot. The safety is an easy push-and-slide mechanism with the index finger. 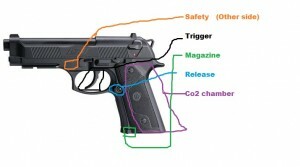 To change the Co2, slide back the handle, exposing the co2 chamber and the screw to tighten/loosen. This gun is pretty fun. As I said earlier, it has the same firing mechanisms as the C11, so it sports both power and accuracy. However due to the heavier build on top, the accuracy slightly suffers, since there’s little recoil to counter the downward droop. Also, there were times on occasion when the clip ejected the rounds when I tried loading. Nevertheless, this gun earns a 8.9 / 10. This entry was posted	on Friday, June 11th, 2010 at 8:34 PM	and is filed under News. You can follow any responses to this entry through the RSS 2.0 feed. You can leave a response, or trackback from your own site.